This year Christmas comes very close to my half-year of decluttering anniversary. Having looked so carefully at each and every one of the more than 1,200 things I’ve decluttered, I can say for sure that I have very little interest in purchasing. The girls, too, have been decluttering with me every step of the way. They very much acknowledge that most of the gifts they’ve received have really not been as fun, interesting, or welcomed as anticipated. The amount of books, craft kits, and art supplies that have been shifted out of their rooms and into other homes is remarkable. In addition to Christmas gift-giving, Clara’s birthday and her first diabetes diagnosis anniversary are the week before Christmas. While I try to look on her diagnosis day as “the day her life was saved” not “the day the wheels came off the bus,” there’s no denying that it has been earthshaking and deserves some sort of special acknowledgement. So what will we be giving and getting this year? Clara desperately wants her ears pierced. She will turn 11 in December, and she’s always been told that she could not get her ears pierced until she turned 13. As I said before, her birthday and diagnosis day are close together, and I figure that since she pokes herself to test her blood sugar at least 10 times a day, she can handle two more pokes. I’ve invited her three closest friends and their mothers to meet us at the mall on the anniversary of her diabetes diagnosis, and we will all go to the earring store to watch her get her ears pierced. Then I’ll treat everyone to lunch. I think this will truly be a memory for a lifetime, just like Audra’s kitten. For Christmas, I’ll get her some earrings and let someone else get her the books and calligraphy set she’s asked for. My husband’s family (four adults and one toddler) is a bit more of a wild card. I have finally realized that I can’t control them, I can only control myself. (It only took me a dozen years of trying to manage their gift giving for me to come to this fairly obvious conclusion.) All of us are blessed with plenty of income and the ability to buy everything we need and most things we want. What that means is that I will be informing them what sort of gifts we’ll be giving by sending an email that finalizes our visiting plans and states, “As in years past, the girls will be buying a gift for (the baby), and we will be making charitable donations for the adults.” (Hmm, I think that might need a little work, but you get the idea.) In return, I will ask for a donation to the Juvenile Diabetes Research Foundation (www.jdrf.org) or a gift certificate to my favorite store Amazon.com. What they do with that information has to be up to them. Will you be having a Buy Nothing Holiday? 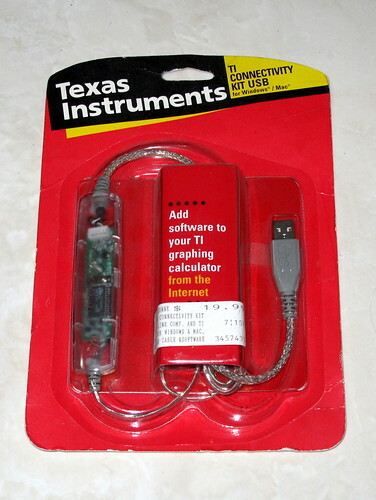 A cable that we received free with one of those fancy schmancy calculators that the kids required in high school. The calculator was used but the cable never was. Not only remembering to go to the supermarket on the way home from the airport but getting everything I went there for – I have been a bit of an airhead lately. Steve remembering to get the lawn mowing man his Christmas carton of beer while he was at our house today. An afternoon nap – I had a headache all day and needed some relief. Those new cushions came in really handy. A great response to today’s (yesterday’s now) post – I had a amusing time reading about the odd things people have as clutter/precious possessions. I wrote a post on my Facebook wall telling everyone what I intended to do give and what I hoped to receive and linking to Zen Habits: incredibly I received lots of enthusiastic comments and likes from my friends! 🙂 Merry Xmas to you Cindy, to Colleen and to all your readers! Good link Paola and a worthy read. Thanks for starting today’s conversation. Cindy, Our family does a very low key Christmas gifting. Among our children, we draw names and purchase one gift per person. Even the preschooler will get only two gifts from Meema, Bap, and the aunts and uncles. What couples do between themselves is up to them. I’m giving my husband one gift–something he requested. In addition, we don’t impose limits on stocking stuffers–everyone seems to love to pop a little gift card or candy bar in them. Last night my husband and I went through the $ requests from charities and chose which ones will receive a donation. We’ve been talking for years about having a gift free Christmas and buying ourselves–us, kids, spouses, and grandboy–a trip somewhere special instead. Experiences provide memories! I can really relate to the stocking suffers! I needlepointed stockings for everyone in the family, and now we all love our stockings so much that we fill them even fuller than before. I wouldn’t have predicted that a nicer stocking would equal more and better filling, but it did. I think it’s wonderful that you are marking your daughter’s diabetes diagnosis. My sister was just 2 when she was diagnosed with Type 1 (I was 13), and it was hard to explain everything b/c she was so little and just screaming and terrified during her week at the hospital. Unfortunately, that’s all she remembers from that time, I’m not sure we could’ve made it more positive than we did, but I think it’s great how you’re handling it! I hate to hear about anyone being diagnosed with D, although I remind myself, there are quite a few other diseases I would prefer my daughter to have even less. I hope your sister has adjusted well after a very rough start. I went to your site today. The very best toy I ever got my girls were six 3′ square silk squarves, often advertised in Waldorf catalogs, although I bought mine on Ebay. Those have been everything – costumes, head coverings, tents, capes – and they were used almost daily for four or five years. That’s a a good purchase! Excellent post, Cindy, and great link, Paola – it’s a two for one today! One very personal to show in detail how to buy less and the other an overview of the same thing. We’ve been heading in this direction for years now by giving things that are consumable (food, toiletries, gift cards, calendars), things that are small (eg, jewelry), and asking people for direct suggestions if we truly can’t come up with something. This year we are going together on a large gift one person needs; giving to one person’s favourite charity; home baking and home-assembled fruit/treat baskets; and even money, so that people whose tastes we don’t know (but whose contributions to our dad’s life are truly appreciated) can decide for themselves how they will spend what we want them to have. It is an incredible relief to reduce the shopping, the clutter, the wrapping waste, and the general frenzy. I think this is definitely more of a challenge for those with younger children. One thing we used to do was tell our kids that Santa only brings one toy per child; anything else under that tree is from the parents even if it says Santa on it! This helped them make sense of what they saw in some other homes where there was a heap of large gifts, all from Santa. Santa. That can be a tricky one. In our house, Santa usually brings the one big, best gift, but at Clara’s friend’s house, Santa fills that stockings. Thank goodness the girls don’t think too terribly deeply about these variations. I don’t know what Santa’s going to do around here this year. Audra’s actually already gotten her kitten, whom she named Ash. I don’t think there’s any topping that! Cindy, It brought tears of happiness to my eyes to read about your 11 year old getting her ears pierced very soon! Having her friends there and then going to lunch, oh what a joyful celebration! Thanks for the suggestion about giving to a charity! WONDERFUL!!! We don’t do much for ourselves. We have what we need for the most part. If we need something along the way we tend to get it or put it in the budget until we can get it. As for giving to others. We try to make things they can use. Soup ingredients in a jar, composition books prettied up, homemade jams, etc. The idea is just to give them a token to say we love them. That reminds me, Deb, I ususally make a frozen dinners for 3 of my friends. Better add that to my to-do list. Great post, Cindy. I would love to have a Buy Nothing Christmas. I have everything I need or want (and extras besides! ), but unfortunately we are not on the same page in our household. 🙁 It gives my husband great joy to find the “perfect gifts” for me, and yes, he means giftS. So I will graciously accept his gifts and try not to be too concerned about what to do with them or where to put them! 🙂 I am keeping my own gift-giving to a minimum with mostly consumables and practical things, although I think I will indulge my husband’s wish for one “toy”. It would be a novelty if my husband gave gift-buying more than 30 seconds of consideration the day before the holiday or birthday. THAT in itself would be a gift! Fabulous post, Cindy! As always, you’re on it & the other tips are fabulous, esp re Santa & gifts. I’d love to have a Buy Nothing Christmas, but we’ll have a Buy Not a Lot Christmas as long as we have a teen in the house, I’m sure & are buying less each year. I now wish I hadn’t stressed about the material/clutter excess of my daughter’s childhood (deep breath, parents!) because she now (at 15) FINALLY doesn’t want much stuff, mainly airfare for a 2nd summer mission trip-she gets it! she gets it! (happy dance) Personally (and with clients), I’ve discovered decluttering is like eating right or any other positive, difficult step…we do it when we are good & ready, we go as far as feels right to us in our circumstances & we can’t force anyone else (incl spouses & kids) into “aha” moments at the same time (or even decade!) we have them, especially if it’s going to be a positive experience for all! I love that you celebrate everything, including Clara’s diabetes diagnosis, because that positive approach makes all the difference with all of us – we crave the positive, don’t we? Negative talk stops & blocks us, positive energizes us to keep moving forward…obvious, I know, but I remind myself of this. I love to have fun with clients decluttering – we respect others’ boundaries & stuff to focus on stuff/clutter WE control…spouses never decide to declutter & purge simultaneously in my experience! Re holiday gifts, I even have to say the serenity prayer myself every year about those very special extended family members who make what is for me a religious holiday/celebration ALL about the stuff (& food)…it’s their right to do that in a free country, eh? So, this Christmas, I haven’t begun buying much yet & will focus our family celebrations on slowing down & unplugging to hang out & have fun as a family, but don’t hang Mission Accomplished signs here – the mall will see me yet, I’m afraid. Congrats on all your fab decluttering, both mind and material! Susan, I’m so excited and flattere that you visited and took the time to make a comment. Even though the kids, particularly Audra, have been reminding me daily how many more days until Christmas, I haven’t done a lot of purchasing. I think I better get a plan together or it’s going to be ME at the mall Christmas eve, and we can’t have that! So true Susan. We just got back from the JDRF Walk for the Cure Awards Banquet, which was a lot of fun. Possibly my favorite part was when all the siblings got the Helping Hands award. Sweet and really smart of the organizers. I get a lot of my information and support at http://www.tudiabetes.org. You can find me there as carb101. We pared it back as much as you can with kids of 7,4 and 2. Whilst I intend to teach them my ways as they get older, I also think it can be a little unfair, unkind even, to impose beliefs on them too much when they are very young. I do want them to stand apart from the crowd on the important things but I don’t want them to stand out so far that they are ostracised, if that makes sense. I’m secretly rather chuffed that a last minute idea has been the most successful and that it is actually something useful. my children are 19 and 21 and I speak from experience that it is never too early to start to teach them good principles including not coveting and owning too many possessions. Unfortunately modern society dictates this to be the norm and no one wants their children to feel ostracised for being different but too much is just to much and it is easier to instil good habits from the start than to break bad ones. Even though I don’t think that as young children that I spoiled mine excessively at Christmas and their birthdays I still feel I could have done a better job of teaching them to be a lot less reliant on possessions to bring them happiness. I think you will find that even at a reasonable level of gift giving there will still be children who get a lot more and children who get a lot less so they will fall into the norm somewhere. My own daughter is a bit of a shopaholic and I blame myself for that because we spent far to many weekends entertaining ourselves at the shopping mall when they were teenagers. I do seem to have taught them fairly well not to live on credit though so that is a good thing. Even though we were comfortably well off I would always make them wait until pay day before buying something rather than using credit. As your children proved to you they were happiest with the one useful thing that they received. Their friends may think that is a lame gift were it to come up in conversation but clearly they are happy in their own skin and don’t feel compelled to only be happy with stuff they don’t need. Sometimes it is more about our feelings than it is about theirs and we just can’t see it. Don’t sell them short, they may surprise you. My in-laws started drawing names soon after child #4 got married. Everyone still bought for the kids. Now that there are great-grandkids, everyone’s name goes in a hat. Usually we do this at Thanksgiving but we drew early this year. My family? We decided to draw names one year, including kids. Everyone followed the plan except one SIL. She just HAD to buy for the parents. Then she saw something really nice for my kids (and went overboard). Then she had to buy for her kids then didn’t want the other kids to feel left out. She ended up buying gifts for everyone except two people. Polite words escape me. Amazon is one of my favorite stores too. And everyone know it! Every Christmas we celebrate what we call Freebie Christmas. Nothing may be bought, everything has to be free, like a coupon for a free box of detergent or an ice-cream cone. When the bank gives me a thank you pen, or blank book, or backpack for opening an account, these go into the freebie box. By the end of the year, I have gifts galore for every one. One year a friend gave me a set of stoneware loaf pans she no longer wanted, brand new in the box! These went into my freebie box. As a result of a year of collecting “new” stuff, I have lovely things to give to my family and extended family. A store was going out of business and you could fill a bag for $5. I filled my bag, calculated what would have cos $5 and put the rest into my freebie box. This included 3 beautiful china teapots, which were a great hit as gifts. Since of the gifts have no monetary value, no one minds if the recipient recycles the gift to some one else and NO ONE ever has their feelings hurt, because it does not matter, it is for the fun, not the gift. One year I received those plastic covers with elastic around the edge for covering food in bowls. I had never seen those before and thought they were very clever shower caps in all sorts of sizes, even one for the dog. Another year, my brother had won the contents of an old theater prop room, so we received Tiny Tim Cratchit’s crutch and a beautiful set of replica Titanic china. We do a lot of laughing and enjoy Christmas very much, without any guilt for passing on some of the gifts. Hi Joann, I love this idea. So much so that since most of my readers won’t see it because this is an old post I am going to publish it this Friday as a post. I hope you will get involved in the comments that ensue.